These materials were developed by Sahaya International and its collaborators including READ thanks to generous support of the general public and funding agencies (including Elton John AIDS Foundation). Please note: You must have Adobe Acrobat PDF Reader to view the downloadable files. Some of the files listed below require Adobe Reader version 8.0 or above. If you do not already have Acrobat (or you have an older version), please download the latest version for free from Adobe first. What is it like when HIV or AIDS takes over a child’s world? In Bye-bye Secrets, children, ranging in age from ten to twelve tell us about their experiences and about the secrets and stigmatization that have made them wise beyond their years. It is their hope that this book will be used to help families living in areas where professional counseling support is limited; in health-care facilities to educate and support families; in classrooms to decrease the stigma and to sensitize children and educators to the impact of HIV and AIDS on families. Above all, they want all children with HIV or AIDS in their family to know that they are not alone. This material was developed through a collaboration of The Teresa Group (Canada), READ (India), the Hope Foundation and Sahaya International (USA). It has both Tamil and English text. The pdf file is approx. 3 MB; click here to download the pdf file. This coloring book has a shortened version of the full set of flipcharts with contents that are appropriate also for young children. It has both English and tamil text. The pdf file is approximately 4.2 MB. Click here to download or open the pdf file . 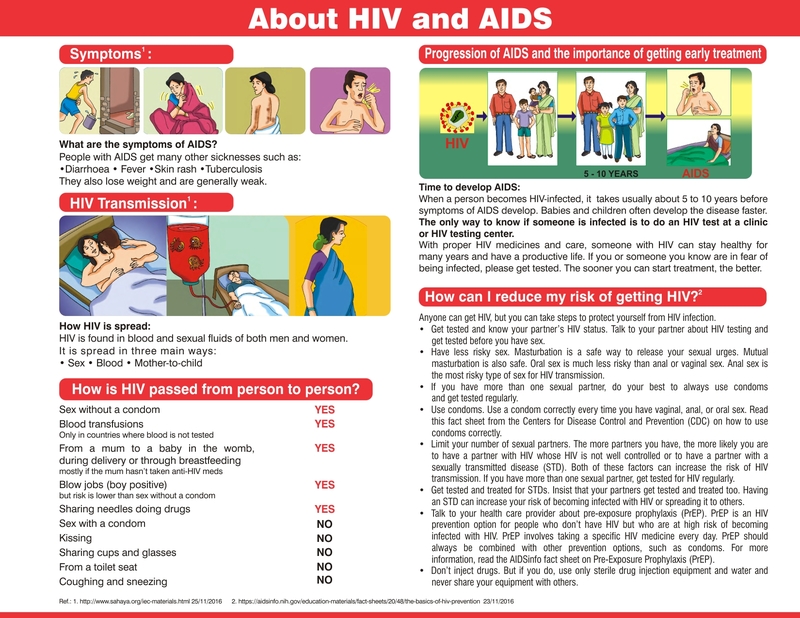 Myths and Facts about HIV/AIDS (Parts I and II), for use in South-East Asia, was developed by Sahaya International (www.sahaya.org) in collaboration with READ, I-TECH (International Training and Education Center on HIV/AIDS) (www.go2itech.com; Univ. of Washington) and Global Strategies for HIV Prevention. These materials are provided free of charge for the education of the whole community. They cannot be used for commercial purposes without written permission of the copyright holder. These materials may not be modified in any manner without our prior permission. They must be presented as is. It is not necessary to present all the cartoons in a set. You are free to pick and choose and add to your collection from other sources. But any adaptation of an individual page without our consent constitutes an infringement of copyright. Copyright of the cartoons is held by Sahaya International/READ and I-TECH. We are very grateful for the many useful suggestions provided by many individuals and groups in India and the USA. We welcome the comments of health care workers, community leaders and other individuals. There are different sets of these cartoons available for free downloading. These flipcharts can be printed out and used as double-sided flipcharts (92 pages), with cartoons on the front, and text (English and one Indian language) for the educators on the back-side. They can also be shown as a slide show. Each complete language set needs be downloaded as 4 separate pdf files (click on titles to open or download). HIV Care and Support part 2 (approx. 4 MB). HIV Care and Support part 2 (approx. 18 MB). Bengali and English text (with special thanks to SAATHII for the translation and additional cartoons). These pdf’s are in a format to be submitted to print as double-sided flipcharts. A pocket-size booklet that is a summary of part 1 and 2 with only tamil text is available as pdf file (32 pages, approx. 3 MB); this can be printed and given as handouts at HIV awareness programs; click here to open or download the booklet. 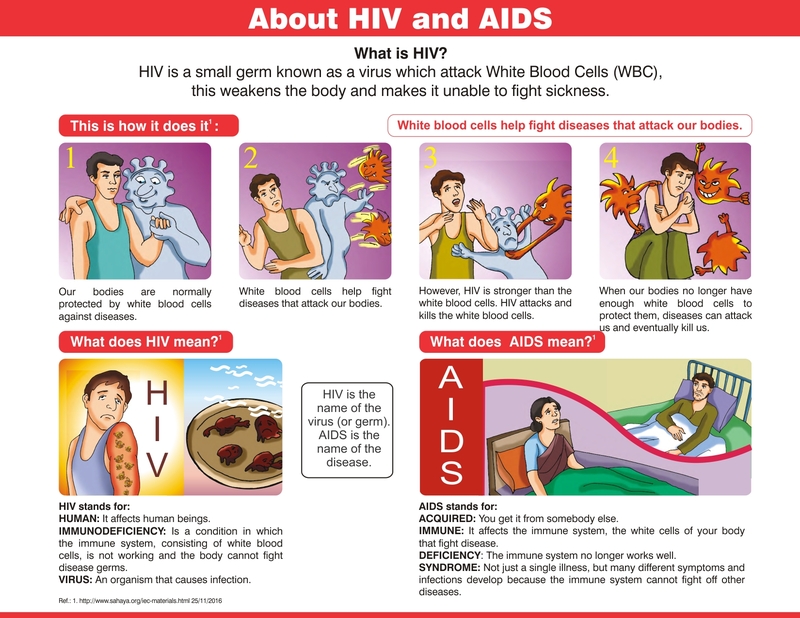 A one-page flyer “What is HIV” was developed by Vijay Thorat. Click to download the front page and the back page. Both pdf formats have cartoons on the front and only English text on the back. We are currently seeking funding and volunteers to translate these PMTCT flipcharts into Indian languages. Because of the sexually graphic content of some pages, please remember that it is not necessary to present all the cartoons. You are free to pick and choose only those pages that are appropriate based on your audience. This manual was developed by Sahaya International in close collaboration with our sister NGO Grassroots Alliance for Community Education (GRACE; www.graceusa.org). The Deaf Peer’s Education Manual can be downloaded freely for your use. Please note that this product is copyrighted. It can be used by you (and you can print or xerox it), but cannot be altered or used for commercial purposes (meaning, to make profit for yourself) without the written permission of Sahaya International. Click here to open or download the pdf of the Deaf Manual 1st edition. This manual was developed by Sahaya Deaf Kenya in close collaboration with Sahaya International and with support of the Gilead Foundation. Click here to download or open the pdf of the Deaf Peer’s Health Manual – A facilitator’s Guide. This is only a preliminary set of cartoons, with English text, which was developed thanks to the assistance of several of Sahaya’s volunteers and experts in reproductive health. As funding becomes available, we plan to develop additional cartoons to cover the remaining topics in human reproduction and sexual health. Sahaya International encourages others to use these cartoons to meet your local needs, e.g. for slide presentations, in printed materials (such as pamphlets, brochures), provided the materials that have been reproduced are distributed free or at cost (not for profit), and that Sahaya International is acknowledged as a source of these cartoons. We appreciate receiving a copy of any materials in which these cartoons have been used. Any organization or person who wishes to copy or reproduce these cartoons of human reproduction for commercial purposes (with profit) must first obtain permission from Sahaya International.